Show your team spirit with this soft vintage toddler tee from LAT's family line of Vintage Football T-Shirts. NOTE: there is a seam stretching across the back shoulders of this item. We cannot decorate over the seam. Please do not position your design objects on top of the seam. As a Football Tee, this shirt is great for Name & Number designs. On the back, the name should be fully above the seam, and the number should be fully below it. This little girl wants you to know that she loves you as much as she loves her waffles! 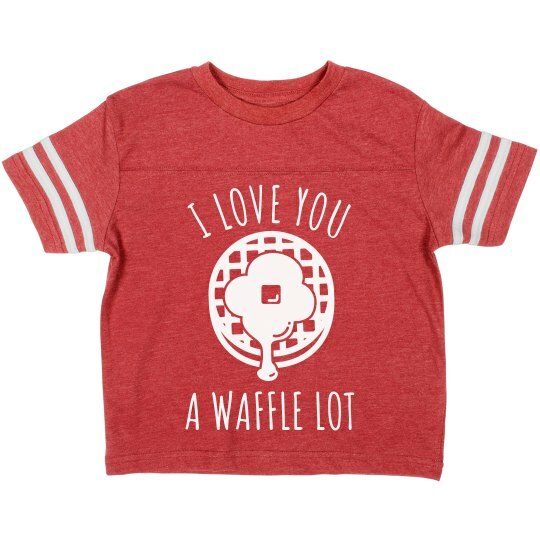 Get this cute custom tee for this coming Valentine's day to have your little girl show some affection to her favorite thing in the world.